Glass Door Designs Temecula; Does Curb Appeal Really Matter? When you purchase your home, it’s probably going to be one of the biggest and most important investments that you’ll make in your life. For your own financial security in the future, you want to maximize the value of your home, not only in case you decide to sell it but so you have the most equity in it possible. 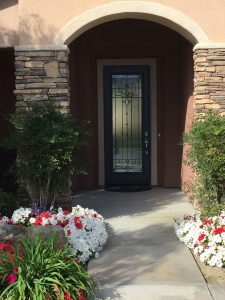 One of the factors that help to determine the value of your home is “curb appeal”, and it’s something that our glass door designs company in Temecula knows a lot about. Curb appeal is essentially how appealing your home looks from the curb. When people drive by, does your home make a good impression? Does your home look well cared for and well maintained? Is it inviting? These are all measurements of curb appeal. While there is no actual scale for curb appeal, it’s something you know when you see it; the home with the most curb appeal on the street is the one that always catches your eye and makes you smile when you drive by it. Homes with a lot of curb appeal make a great first impression on the viewer. Why Does Curb Appeal Matter? Curb appeal can have a big impact on the value of your home. If the exterior of your home appears to be run down, in need of repairs, and dirty, it won’t appeal to as many potential buyers and you probably won’t get top dollar out of your home when you want to sell. Potential buyers will just see all the work that needs to be done instead of your home’s potential. Curb appeal can increase the value of your home for resale purposes, but it could help increase the amount of equity in your home, too, which could be beneficial if you need to borrow against the value of your home. Increasing curb appeal doesn’t have to be hard! Simple things like a fresh coat of paint and cleaning up debris can go a long way to making the exterior of your home look more inviting. Our glass door designs are another great option and something that many Temecula residents are taking advantage of when it comes to fixing up their homes. Our glass door inserts allow more natural light to enter your home via your front door, something you can enjoy inside, but they also look stunning from the street. They are definitely an eye-catching addition to your home that can make your home look even more beautiful. If you are interested in investing in the exterior appearance of your home and boosting your curb appeal, out glass door designs team in Temecula would love to help! We offer a variety of glass door designs including custom pieces that provide you with the natural light, privacy, and exquisite beauty hat you want for your front door. Make an incredible first impression and contact us today for a free consultation!